The design has gone one step further and has four frequency bands under one hardware, while maintaining as close as possible, the superior performance of Circuit Design's conventional RF modules. Circuit Design radio modules are targeted at long-range and battery-powered industrial wireless data transmission applications where high reliability is required. Embedded relay function extends the range up to several kilometers. 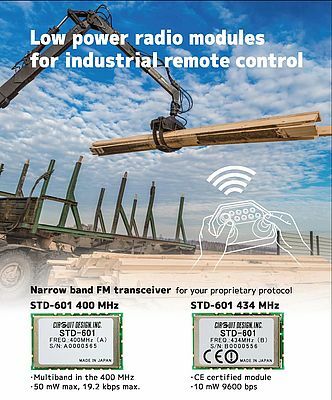 The STD-502-R by Circuit Design is a 2.4GHz embedded radio transceiver which has been developed to provide reliable communications for industrial applications, e.g. remote control of industrial equipment, industrial telemetry and monitoring systems. Circuit Design's STD-502-R is a 2.4GHz embedded radio transceiver which has been developed to provide reliable communications for applications in telemetry and monitoring. It features a communication range of 300m and a data range of 9.6/19 kbps.